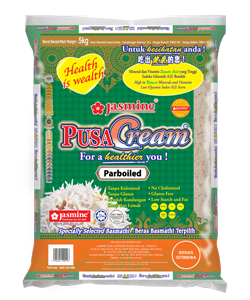 Specialty Rice | Jasmine Food Corporation Sdn. Bhd. JASMINE’S SPECIALTY RICE: THE HEALTHIER, TASTIER CHOICE! Jasmine’s range of basmathi are highly sought by food connoiseurs for their taste and special features such as extra long lengths, fluffiness and aroma. These unique rice products are imported from basmathi’s place of origin in Punjab, India and are premium in quality. The planting fields located at the foothills and plains below the Himalayas provide the perfect place for the world’s renowned basmathi rice. Research found that the cool, clean waters of the Himalayas and the high mineral content of the soil in the region are the reasons for such a distinguished crop. 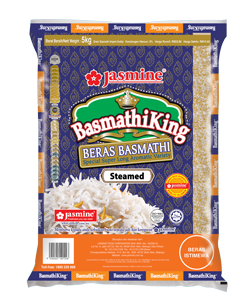 Basmathi rice has a typical sweet corn-like flavour giving basmathi its distinctive aroma and taste. Due to this inherent feature, basmathi rice is also know as “the Fragrant One” or the “Prince of Rice”. 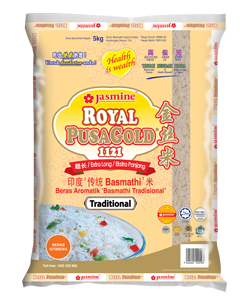 Royal PusaGold is high quality basmathi processed in the traditional Indian way. It is not steamed or parboiled. Due to its natural taste and aroma it appeals to the Asian palate and pairs well with their cuisines. This special is a new premium quality basmathi with golden, cream-colored grains. It is dry and fluffy, and elongates to double its length after cooking. Provides a wonderful taste and aroma. This variety is a high quality, golden-cream coloured basmathi that captures the hearts of the discerning food connoisseurs. Aromatic, non-sticky with extra long lengths are its inherent appeal. This long grain variety is another top quality specialty rice that is popular with the masses due to its affordable pricing. It has the same extra long length, aroma and taste inherent in basmathi rice. This extra long variety is preferred by international food connoisseurs for its taste, extra long length, aroma and fluffy features. A premium quality product for those who appreciate its uniqueness and appeal. 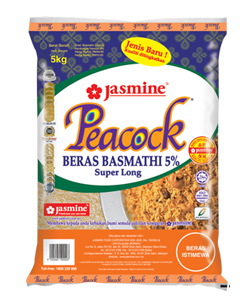 Peacock is Jasmine’s first imported basmathi product. It is popularly used in restaurants and eateries. It continues to enjoy a good following among the general populance. Usage: Restaurants, home cooking, nasi bryani, nasi tomato & nasi kandar.